No further introduction was really needed for tonight’s beer. 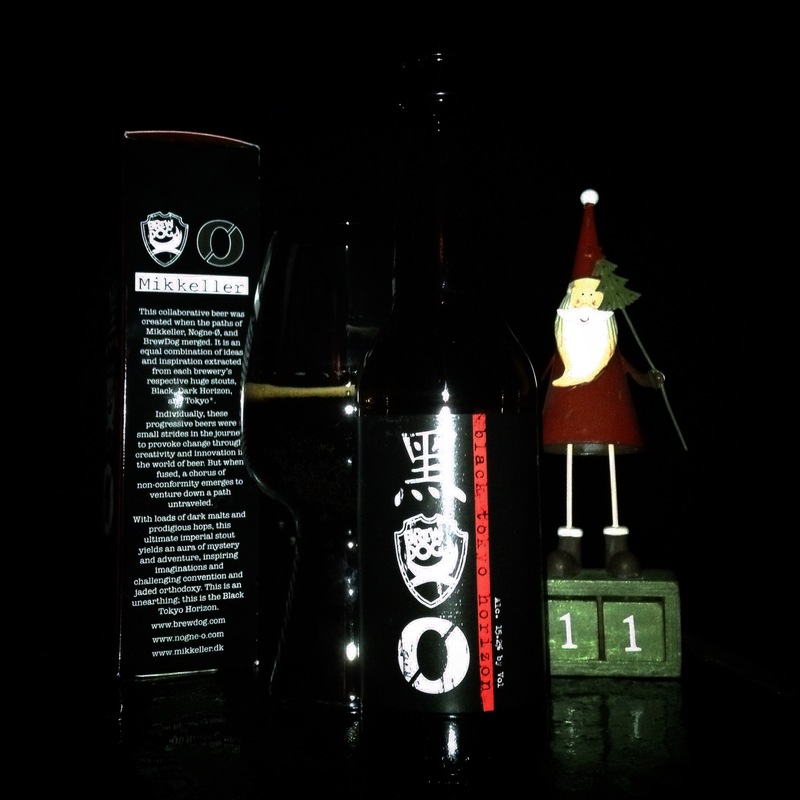 A collaboration between 3 of the biggest craft breweries in the world, this beer brings together Black by Mikkeller, Tokyo by Brewdog and Dark Horizon by Nøgne ø into one beast of a beer. As what a beast it is! The pour is black and nothing else. So black that the head is doing it’s best to be black also. There is so much going on with the aroma. I’m getting marzipan and cherries. Then I’m stood in a log cabin with a roaring fire and a fresh pot of coffee. Then I’m in the middle of a deep dark pine forest. Then. Then. Then. I simply haven’t got the words or vocabulary for this beer. OMG. It’s smooth. It’s a vanilla espresso. Smoothness then you’re hit with this wonderful roasted bitterness that just doesn’t go away. As it warms the flavours are intensifying and there’s subtle hints of chocolate and thick treacle. It’s thick, warming and the perfect Christmas treat, and it doesn’t forget to let you know that it’s 15.2%. Tomorrow, this year’s journey ends with Camden Town Brewery’s ‘Beer 2014’. Before then check out what else has been going on through Storify below (or on our Storify page) and check the ‘blog directory’ here for the latest writings.